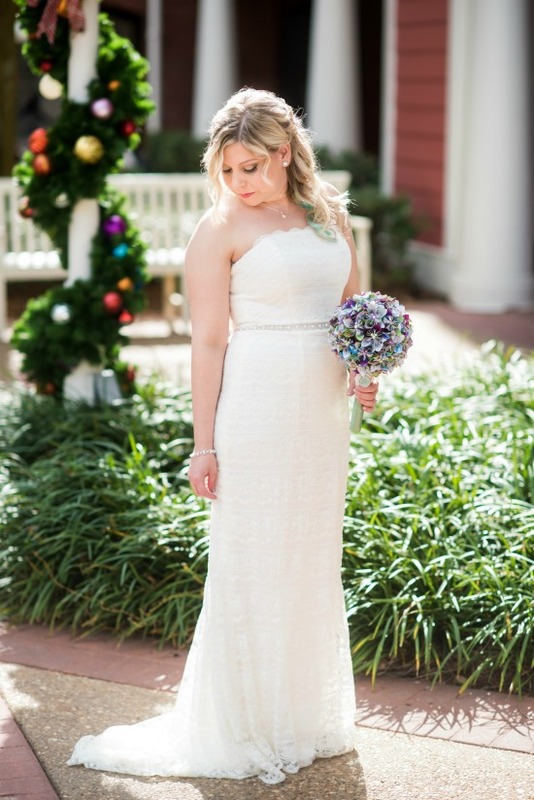 Disney Bride Lauren planned a Walt Disney World “Mini Wishes” wedding at the Wedding Pavilion and The Attic for December 2016. 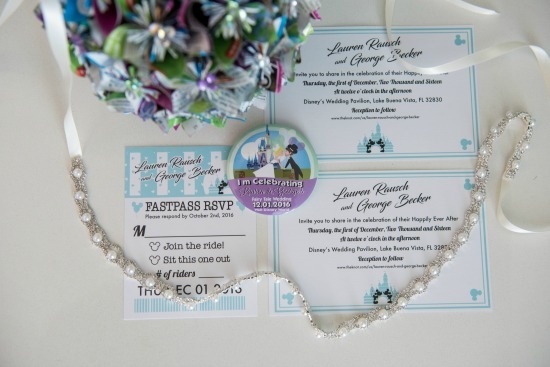 When Mindy contacted me about being a real Disney bride contributor for her blog and to talk about the planning process for our Walt Disney World wedding, I was so excited. Now that the planning is done and our wedding day has passed, I’m even more thrilled to recap and give you all the details on our BEST DAY EVER! Thank you to everyone who has followed along with our wedding planning and to all of the Disney brides (past and present) who have offered me their friendship, kindness, and advise along the way. This community is truly amazing and I’m so thankful to be a part of it. Disney has been a big part of our relationship since the very start. We had our first date at Disney’s Hollywood Studios, got engaged on the Disney Dream, and have made countless memories as annual passholders over the years we have been together. 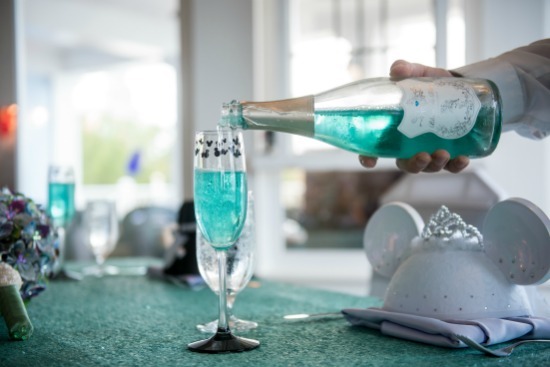 We also loved that the planning process for a Disney wedding was, for the most part, all-inclusive and we wouldn’t have to keep track of several different wedding vendors. Disney took care of everything. My family had mixed feelings. 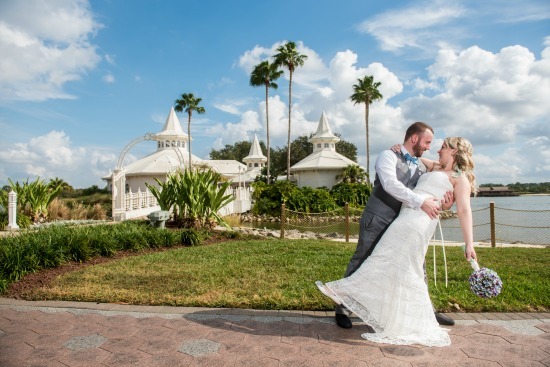 While they weren’t surprised that we wanted to have a Disney wedding, some were upset because they knew it would restrict how many guests could come and they are all used to having large weddings. Some family members were upset that they weren’t invited, but in the end everyone understood and supported us. The few friends we did invite were absolutely thrilled that we were having a Disney wedding. 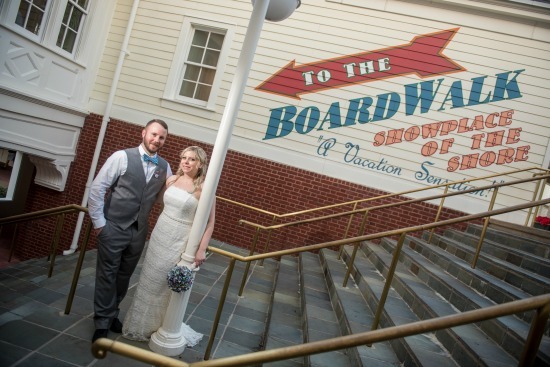 Our wedding was a vintage Disney/Boardwalk theme. I wanted to incorporate colors that would look amazing in our chosen venues, so we chose grey, mint, and lavender. I knew I wanted vintage Disney touches, so we had vintage attraction posters of our favorite rides for our table numbers, with a Mickey balloon attached to our centerpieces. 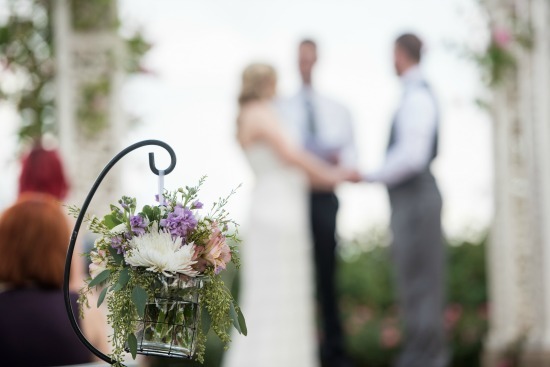 We kept all of our floral simple and whimsical in an assortment of vintage glass and vases. 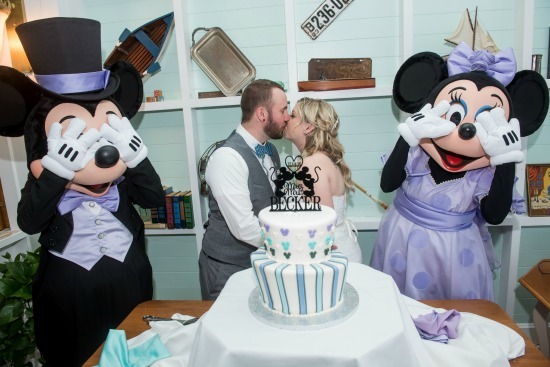 We also had Mickey heads all over our wedding cake and a Minnie and Mickey cake topper, a “Once Upon a Time” cardbox, Vinylmation guest book, Mickey and Minnie bride and groom ears on our sweetheart table, custom “I’m Celebrating” buttons as our wedding favors, and my bridal bouquet was made out of Disney park maps. Our biggest challenge was sticking to our budget and compromising on certain aspects of the wedding. 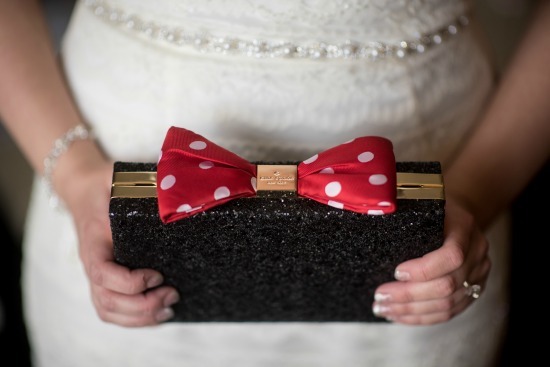 My planning process was very different than most brides in that my fiancé was very involved. He was very opinionated and a lot of his ideas clashed with mine, so we had to learn how to compromise and make this wedding day for the both of us which, I have to selfishly admit, was hard for me at times (since I had secretly been planning my dream Disney wedding for years). We also had a hard time sticking to our budget (and actually went over) because we wanted our day to be perfect and not have any regrets down the road. In the end, we overcame both challenges and our day was perfect. Our ceremony itself was very short and sweet. I was very nervous about the wedding ceremony and being the center of attention, so my husband and I did a first look, which I HIGHLY recommend for nervous brides. It was perfect and made a lot of my nerves for the ceremony go away. It also gave us extra time for pictures and some of the pictures from before the ceremony are my favorite from the whole day. I had both of my parents walk me down the aisle because I’m very close with both of them, which was a special moment for me. George and I wrote the whole wedding ceremony ourselves so we could add our own touches to it. We also wrote our own vows. 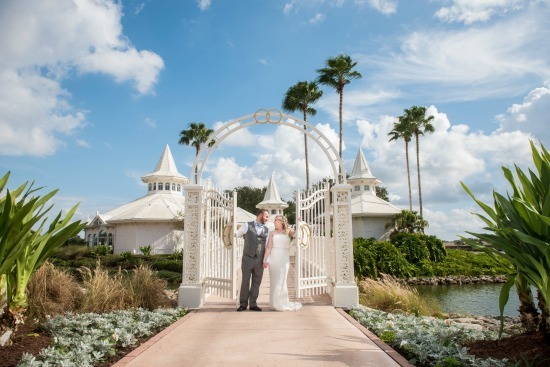 Since our ceremony was very short, we didn’t include any Disney touches décor-wise, however, our ceremony was at Picture Point and you can actually see Cinderella’s castle from there, which I suppose is the ultimate Disney touch! For floral, we had a light scattering of rose petals down the aisle, and we had two Shepard hooks with buckets of wildflowers on each side of the aisle. 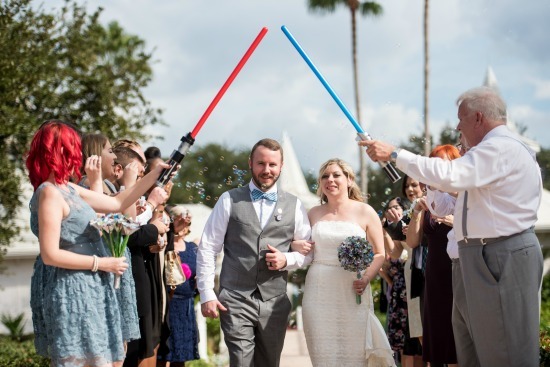 We also incorporated Mickey balloons into our post-ceremony portraits for a whimsical touch and had our Best Man and Maid of Honor hold lightsabers for our staged exit. Our reception was shorter than a typical reception because we had the Mini-Wishes (Catered Event Experience) package, so it was a three hour reception instead of the normal four. With such an intimate guest list, this was the perfect amount of time and we didn’t feel like we missed out of anything by cutting it a bit short. 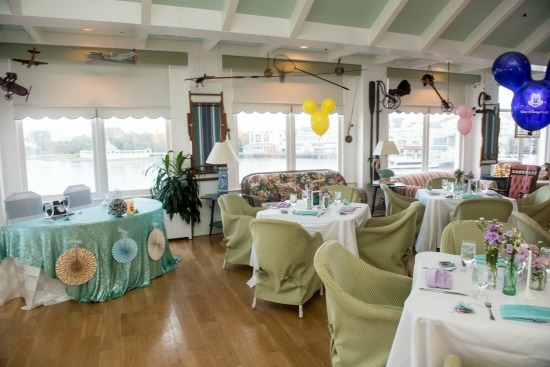 Our reception was at The Attic, which is a private event venue at Disney’s Boardwalk, and its theme is super kitschy and has a large, outdoor patio that looks out to the Boardwalk (the reason we chose this amazing location). We did not have any formal introductions, seating charts, or a DJ. Instead we made our own playlist of music (mostly our favorite film scores and Disney music) and brought our own speakers and iPod to save money. We also had no dancing, aside from our first dance and father-daughter dance. We had a lunch buffet and included some of our favorite Disney parks food such as the sweet and spicy chicken and waffles from the Magic Kingdom, build-your-own Cobb salad from the Hollywood Brown Derby, and Mickey ice cream bars for dessert. We also surprised our guests with not one, but two sets of characters at our reception! As lunch was wrapping up, we had characters from the 501st Legion, a charity group of Star Wars cosplayers, come and entertain our guests. We had Darth Vader, Boba Fett, and two Stormtroopers join in on the fun. 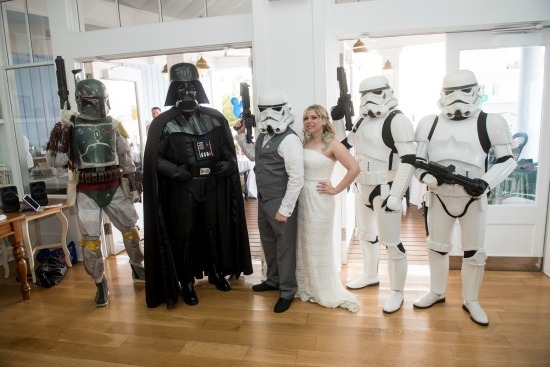 Our guests loved them and it made my husband’s whole day to have his friends from the Dark Side there (he is also a Stormtrooper in the 501st). 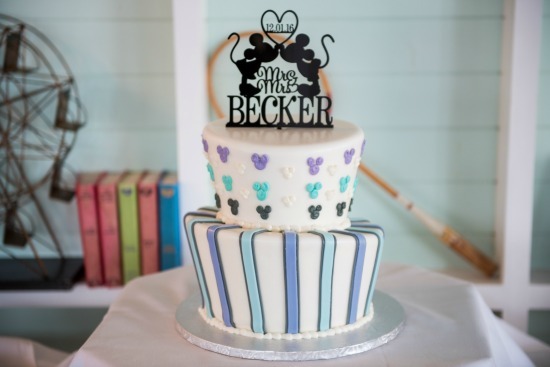 When it was time for the cake cutting, we had two more guests join the party … Mickey and Minnie! This was my splurge for the wedding day and something I had to have or it wouldn’t have felt like a Disney wedding to me. We splurged on photography and our character experiences. 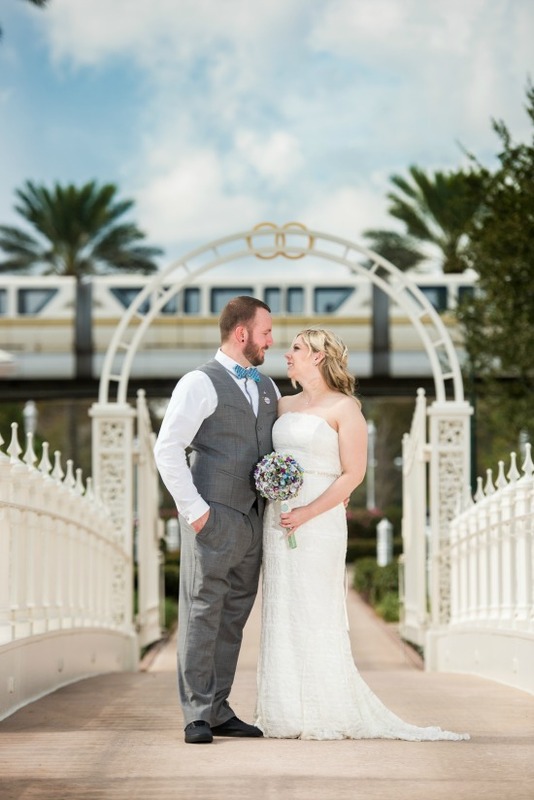 Photography was the most important aspect of our day, aside from actually having a Disney wedding, so we focused on hiring a photographer who’s style we loved but also knew Disney very well. 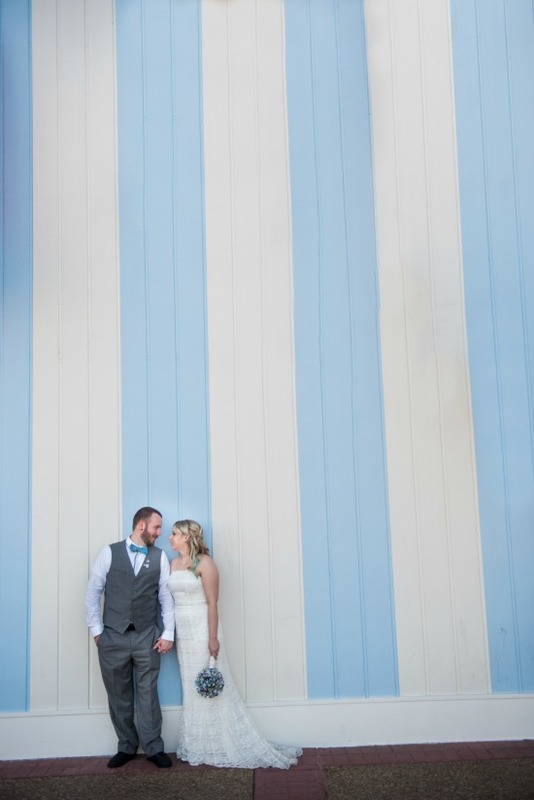 While our whole event was only four hours long, we chose a seven hour photography package so we could get all the pictures we wanted before the ceremony, as well as an extra hour after the reception to take pictures on the Boardwalk. We also have a Magic Kingdom and Epcot bridal portrait session coming up in February (portrait sessions were blocked out in December) which we cannot wait for! 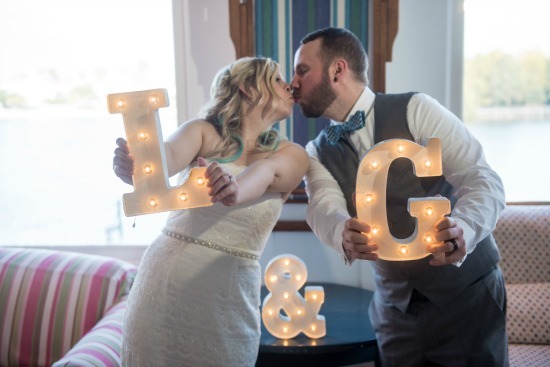 We absolutely love our photos and have no regrets splurging on this. We saved money on floral and décor. We had minimal floral and décor at our ceremony since we knew we wouldn’t be there long. We brought the little bit of floral we did have at our ceremony over to our reception and used it for our sweetheart table. Our floral centerpieces were small and in-season. 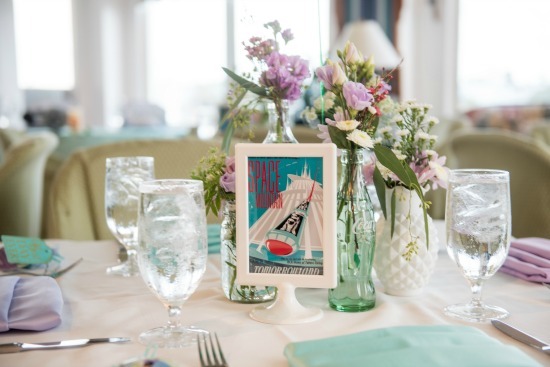 We also saved money by bringing a lot of personal décor touches ourselves, such as table numbers, guest book, card box, cake topper, and champagne flutes, rather than getting those through Disney. Finally, my bridal and bridesmaids bouquets were park map bouquets that were purchased from Etsy. They were a tiny fraction of the cost of a real floral bouquet. Hearing my husband’s vows that he (kind of) wrote himself was my absolute favorite moment of the day. Music is a big part of our relationship and he took song lyrics from all of my favorite songs and artists to write his vows and they were absolutely amazing! Another favorite memory was walking into The Attic before all of our guests got there and just taking everything in. Everything I had planned and envisioned came out perfectly and I was so happy to see my vision come to life. Our day was pretty perfect and there’s not much at all I would have changed. The only regret I have was not adding on a Dessert Party because I didn’t think it was in our budget. Then when I changed my mind and decided I did want one, none of the venues that I loved were available. If I had to do it again, I would have told our planner right away that we wanted one and then cut it if it didn’t work out with our budget. Don’t be afraid to ask your planner as many questions as you need. The worst that could happen is she will say “no.” When we wanted the Star Wars characters at our wedding, we were told we couldn’t have them, but our planner worked with us and Disney to make it a possibility and we never would have had them if we didn’t ask. 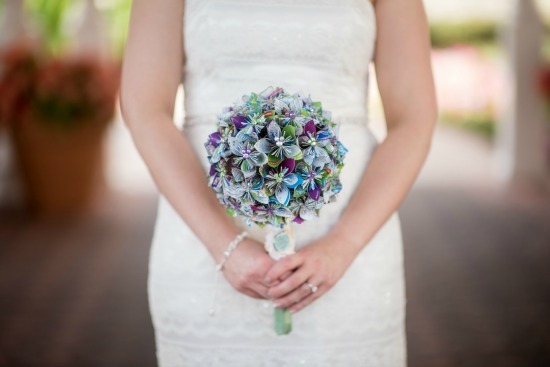 Be yourselves and include what you love into your wedding day! 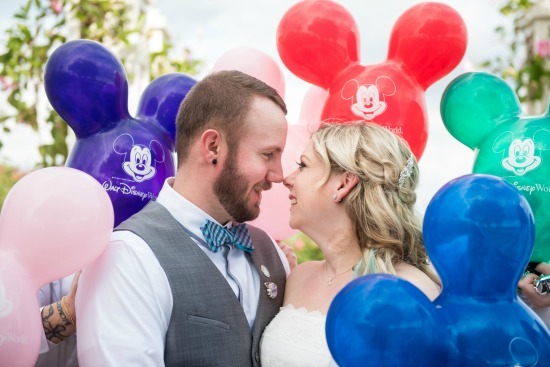 I knew a lot of my guests wouldn’t care about the Disney or Star Wars characters we had at our wedding, but in the end, everyone loved having them there and complimented us on having a wedding that was totally “us.” I was also worried about our guests not understanding our smaller Disney details, but they were very important to us and we loved having them. Start a planning journal on the Disboards and join their companion group on Facebook. Both were such valuable resources to me and I’ve even made some great friends in the process! Etsy will also be your best friend.